Cocktails are not something I know much about. There was a certain bar in Baker Street we used to frequent when I was a student, where a certain Aussie barman gave us half price cocktails when he was in a good mood. But sadly his moods took a turn for the worse when his overtures were rebuffed by one of our group. Other than that, I can probably count my cocktails on the fingers of one hand – maybe two if pressed. However, there is something rather alluring about them and I expect if I had an independent income I’d drink more of them. 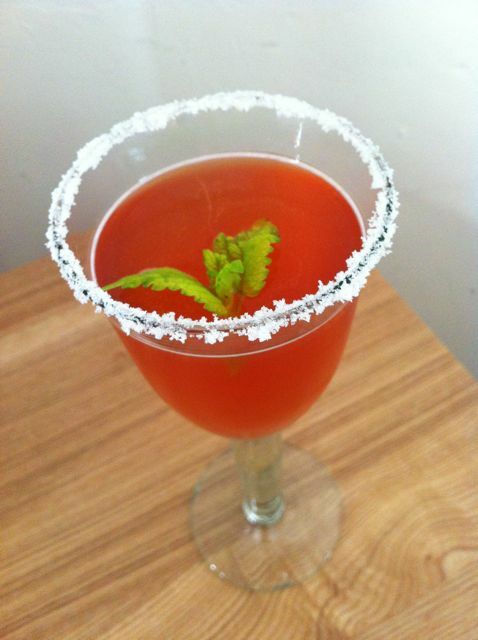 So when Urvashi of Botanical Baker challenged us to come up with some summer cocktails, I just couldn’t resist. Although I’m not much of a drinker – honestly – I do make my own liqueurs: sloe gin, cassis, rhubarb schnapps and various other vodka infusions. I’ve had some cocoa nibs soaking in vodka now for over six months, so I figured it was time to test out my attempt at chocolate extract and concoct some chocolate cocktails. Having used three rose flowers to make some rose sugar, I was left with one glorious bloom. Sadly the weather was not favourable, so I thought I’d harvest it before it got blown away. What better use than to make rose syrup which would be perfect for a summer cocktail. Ran a little lemon juice around the rim of a glass then dipped the glass into a saucer of rose sugar (caster sugar). Placed all the above ingredients in a well sealed jar and shook. Strained into the glass and added a sprig of lemon balm. Rhubarbarella was the star of the show. Rose and rhubarb had already proved themselves as a flavour pairing in the last lot of Nonnettes I made so I had high hopes. It was delicious, fruity, refreshing and with a definite kick – of chocolate as well as alcahol. The rose flavour added a layer of sophistication, or so it seemed after a few sips ……. The colour was alluring and I impressed myself with the sugared glass. I’d be happy to drink this all summer long, which by latest reckoning, ends tomorrow. Although the chocolate came through quite powerfully, I wasn’t quite so taken with chocadoodledoo due to a slight bitterness from the mint schnapps. Next time I’ll add some sugar to counteract this. It was certainly bracing, the mint schnapps being noticeably stronger than the rhubarb. However, I’m not giving up on this one, there will be a next time. * Rose Syrup The rose syrup was absolutely delicious and I can see many uses for it, not least added to sparkling water and used as a drink. I made it by adding 200g golden caster sugar to 200ml water and putting this on a low heat until fully dissolved. I added the petals of a deep red rose and left to not quite simmer for half an hour. I then strained the syrup into a bottle and left to cool. As I have used mint and lemon balm in my cocktails, I am submitting this to Karen’s Herbs on Saturday. A challenge I keep meaning to join in, but somehow keep forgetting about. Kath, it’s something it would be far too easy to get into, so I’m not sure how much more experimenting I should do :-S Rose syrup is a revelation – so easy and so delicious. Love the names , rhubarbarella and chocadoodledoo, very imaginative. I have some Rose Syrup in need of using! Excellent idea, and I adore your names! I love the sound of these, especially the rhubarb and rose. Like you, I make my own liqueurs but I’ve got to stop – I’m getting a liqueur backlog. Maybe I should start thinking about making some cocktails. I’m with you on the liqueur backlog Phil, I love making them but hardly ever use them. A summer of sipping cocktails it is!!! That made me giggle Johanna – free beer sounds much more studenty! I’ll get CT onto his new career of naming cocktails as he is the genius behind one of the names anyway. I did manage to crank up the old brain cells and name one of them. chocadoodledoo is now my most favourite cocktail EVER!… I love this challenge… must add it to the bloggers diary! Hehe, I can see you and the Viking sipping cocktails in that lovely garden of yours. I will have the Rhubarbarella pleas. Just in the mood after a lovely day in the garden with 2 sick children lying indoors! I don’t know if I trust myself to make my own liqueurs. I would drink them way to often. But, they would make top presents though for very little money. I can’t believe how easy rose syrup is to make and it is the most wonderful colour too! One coming your way Laura. Rose syrup is my new found wonder. Hope your kids make a swift recovery and don’t pass anything on to you. Wow, love these. Do you have recipe for your rhubarb schnapps you could share? Janice, I’m a bit rough and ready with my liqueurs. For the rhubarb I fill up a large jar with chopped rhubarb, add sugar to taste (depends how sweet you like your liqueurs – probably about 1/4 to 1/6th sugar) then fill with vodka. Thanks for that, I may make some at the weekend. Forgot to say, leave for as long as you can – at least six months, but a year is better. Then strain, bottle and enjoy. Wow! what a super group of cocktails, I tend to stick to old favourites, but I think it’s a great idea to use some of your own liqueurs, well done. And the rose syrup looks divine. What a shame, I don’t have the ingredients ready now. Would have loved a Chocadoodledoo! Choc, these are wonderful! I tried making chocolate extract, but it didn’t work very well – I shall try again! Do you have a recipe for your rhubarb schnapps, please? Thanks.. This was the first time I’ve used the extract – it’s not a very strong chocolate flavour, but it’s definitely there and smells wonderfully chocolatey. If you see my reply to Janice further up, I have given the recipe there. It’s always a pleasure reading your blog. I love to see some cocktails on your blog, Choclette! The rhubarb and rose combo sounds just perfect for a sunny afternoon. Thanks Hazel – oh for a sunny afternoon! Such unsual ingredients but love them! Refreshingly different! Ah, crikey. Those cocktails are literally making my mouth water! Really inventive unusual cocktails, thank you so much for sharing them! Choclette you and CT are a good team!